The wilderness training journey begins for the 2013-2014 Certification Program students! Our students have begun their nine-month journey to become stewards, survivors, naturalists, and trackers. Students met each other and mingled during orientation day. Samantha is fired up and ready to hit the ground running! 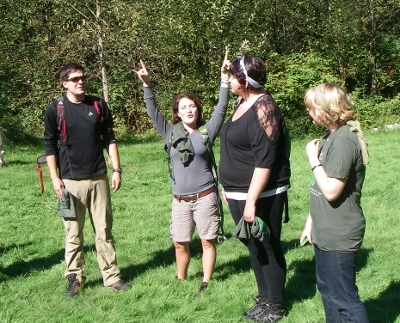 After orientation day, students were introduced to bird language, naturalist skills, and wildlife tracking. This week half the class is on a field trip to the Oregon Dunes to study wildlife tracking, plant identification, coastal dune ecology, and learn new survival skills; while the other cohort learns bow-drill fire-making, survival shelters, and navigation. 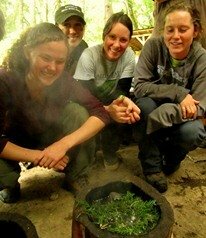 Please give a big warm welcome to all of our new students in the Alderleaf Wilderness Certification Program of 2013-2014. We're excited for another great year! Learn all about wilderness training at the Certification Program. Visit for the course for a day, get a tour, request a catalog, or apply for next year!